The Brazilian startup Urban3D aims high. According to its website, the mission is “to eradicate homelessness within the next 15 years” by revolutionizing the construction industry with the use of 3D printing and robotics. The first question, for sure, is ‘how?’ but the company isn’t providing too many details. In an email interview, its founder Anielle Guedes tells me that her idea is to produce pre-molded pieces of concrete that will later be assembled into houses, buildings or even the infrastructure needed to create an urban area, like sidewalks and street lights. Urban3D is getting a lot of attention and Guedes was invited to speak about her project at a United Nations conference in Geneva last year. According to the UN World Urbanization Prospects report, published in 2014, an additional 2.5 billion people are estimated to live in urban areas in 2050. Three countries alone – Nigeria, India and China - are expected to account for 37% of the growth of the world’s urban population during this period. More and more houses and infrastructure will be needed to cope. However, Urban3D is not the only one trying to bring 3D printing to this sector. The Italian firm WASP has developed the 12 meters-tall 3D printer Big Delta. Big Delta builds up layers of clay, forming eventually a house structure. The official Chinese newspaper People’s Daily reported last year the construction of a whole 3D-printed villa in the Shanxi province, northwest of the country. But again, in both cases, little was said about the technology itself. What we do know is that, whatever the detailed spec, it is still not commercially available. 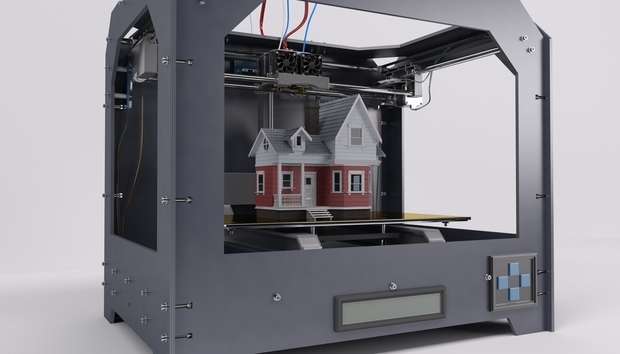 Nobody lives right now in a 3D-printed house. So the race is on. According to the Brazilian media, 23 year old Anielle Guedes is working in partnership with three German companies, one from the chemical sector, another specializing in robotics and a third one dedicated to developing heavy machinery. Urban3D was born in 2014 when Guedes took a 10-week course at Nasa’s Singularity University, in the Silicon Valley. There, another student asked what she would do with a giant printer; she immediately thought about printing a house. “Although technology can meet diverse applications, our desire is to work with housing. This is a field where we can have a great impact in terms of social and economic development, improving people’s life”. The recycled concrete material the startup is developing seems to be Urban3D’s great asset and a major leap forward. It guarantees it won’t be necessary to use metal reinforcement to build a house and that this new product is already 30% cheaper than the average price of the traditional concrete. “We envision creating a process that will enable building at one tenth of the cost, ten times faster, using sustainable materials and without producing any waste,” states the company website. This new kind of concrete would be released next year and the first houses built in the following year. In a world where we already have 3D-printed cars and 3D-printed food, living in a 3D-printed house in a few years’ time might not be such an unrealistic goal.